WARSAW, Poland -- Hundred of thousands have fled to their neighbouring country since the current conflict began, with some taking jobs vacated by emigrants to the west. 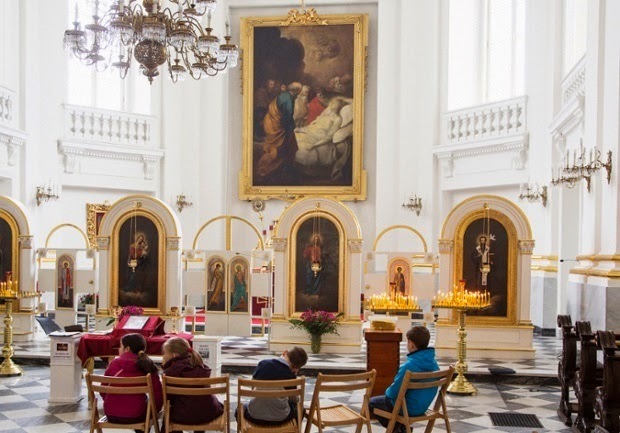 A class for children following Sunday mass in the church of the Basilian Fathers, serving the Ukrainian community in Warsaw. As sunlight streams through the windows of Warsaw’s Church of the Basilian Fathers, a priest in gold robes swings a clanking censer around the altar. He chants with a low intonation, and a choir in an upper gallery responds, their voices filling the airy church interior, which is dominated by huge oil paintings and numerous small icons of haloed saints. She estimates that there are now 300,000-400,000 Ukrainians in Poland, as many as twice the officially recognised number. In January and February, the number of residence applications by Ukrainians in the Mazovian voivodeship – the province which includes Warsaw – was up 180% on the same months of 2014. The migrants have largely been welcomed, with some taking jobs vacated by Poles who have left for western Europe. But the numbers are a new phenomenon in a country more used to emigration than immigration. Halyna, an elegantly dressed 42-year-old housekeeper from Ternopil in western Ukraine, stops to examine a church notice board. She has been in Warsaw for two years with her teenage daughter and son. “I’m here for my two years and I’m staying for my children,” she says. “We are seeing many more people since the war,” adds Katarzyna Sirocka, an ethnic-Ukrainian Polish citizen and head of the Association of Ukrainian Women in Poland. Many of the congregation are working-class migrants from western Ukraine fleeing not the war itself, but its devastating economic fallout. But at the nearby Ukrainian World centre established by the Open Dialogue Foundation, a Polish NGO, to support the community, refugees from war-torn eastern Ukraine gather to seek help. “War is the reason we left,” says Tetiana, 46, who left Luhansk for Warsaw, 1,000 miles away. “Those from the east are in the most difficulty,” says Mateusz Kramek, the office co-ordinator at Ukrainian World. The centre provides practical help and humanitarian aid for Ukrainians, supplying donated clothes and food and assisting in applications for Polish visas and refugee status. There is a resident psychologist working in an upstairs room; outside, a girl waits for her appointment on a soggy sofa, while typing on a laptop. About 70% of those coming to the centre are seeking work or places at universities, while 30% want to register as refugees, says Kramek. Some hope to stay in Poland only briefly, before moving on to the west. The centre doubles as a home of political activity for supporting Ukraine, and regular meetings and events are held. There is a small “Library of Maidan” with Ukrainian books, and a museum consisting of a few cases of memorabilia from the Maidan – Kiev’s Independence Square, the focus of the uprising. Photos of Maidan protesters and Ukrainian banners adorn the walls. A Ukrainian flag signed by government soldiers in eastern Ukraine hangs over a postbox for “letters of hope” to the front. In another room, a bizarre papier-mache model of Vladimir Putin as a Russian doll, complete with a Nazi tie, stands in a cage next to a model of one of the “little green men” – soldiers involved in the Russian seizure of Crimea. Poland’s government has been one of the EU’s most vocal supporters of Ukraine and opponents of Russia’s actions. In this, it enjoys widespread support from the Polish electorate, and Poles donate generously to Ukrainian World, says Kramek. However, relations between Ukrainians and Poles have not always been so cordial, and memories of massacres and forced deportations during and after the second world war linger in some parts. “It’s about 50/50 – one half help us and supports Ukraine, the other half doesn’t like it, and says that we should go back and stay,” says Bohdan Bak, a 29-year-old Ukrainian in jeans and a leather jacket working with three friends on one of the free computers at Ukrainian World. His Polish landlord lets him rent a room for 500 złoty ($141.00) rather than the 600 złoty asking price. Similarities in culture between Poland and western Ukraine in particular have generally made integration of Ukrainian migrants relatively straightforward. Poland’s economic growth ageing population and emigration levels had meant immigration was likely to have become an issue. But the recent influx of Ukrainians may trigger a debate that Polish politicians have previously avoided. “Poland is one of the most homogenous societies in the EU. Only 0.2% of the population are foreigners,” says Jaroszewicz, of the OSW think tank.